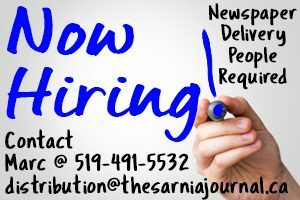 Sir: Mr. Peter Clarke (Nov. 1 letter) apparently believes that well-paid union members and seniors equally well paid from the public purse were totally responsible for Sarnia’s election results. If so, then a hearty “well done” to them. Hard-working union members keep the gas and electricity running to our homes; teach our children; care for us in the hospital; build our homes, businesses and roads, etc., and earn every nickel they are paid. Mr. Clarke also intimates these people lack common sense and knowledge of what is going on in our city. I would remind him that union members and seniors built this city and continue to do so. In addition, they are active volunteers and without them many activities would cease to be. Seniors have had the time to watch council meetings on TV; read the biographies of the candidates in This Week, The Observer, First Monday and The Sarnia Journal; attend candidate meetings and watch candidate videos on computers. Believe me, they know what is going on. Citizens watched the antics of city administration and council during the last four years with disgust. It was a council with a rubber stamp! And a professional earning $183,000 a year that can’t handle the job without crying about harassment should get another job. I may have had a certain amount of respect for Mr. Clarke’s opinion if he hadn’t had the effrontery to mention the Holocaust in relation to the citizens who voted. Words fail me. We are also the generation who remember people who died in the Holocaust. I choose to believe he is gentleman and credit his disparaging remarks to his overwhelming disappointment in the election results. Sir: I would just like to give credit to the organizers for the wonderful Remembrance Day service at the Sarnia Arena this year. I know some don’t like the thought of change, but it worked out beautifully, and everyone was in the warm. Not being originally from Sarnia, I was engulfed in the hour before the parade on Channel 6, learning about the big part Sarnia-Lambton played for our country, and feeling proud to be a Canadian. I sincerely thank our veterans for their service, and for the home we have today. Since I am the only person I know of in the bottled water business who is vocal in opposition to fluoridation, I am likely who Ms. Guichon is referring to in claiming: “people who own water bottling companies” are behind the Fluoride Action Network. As the evidence of harm has continued to expand, so has the desperation of the promoters. 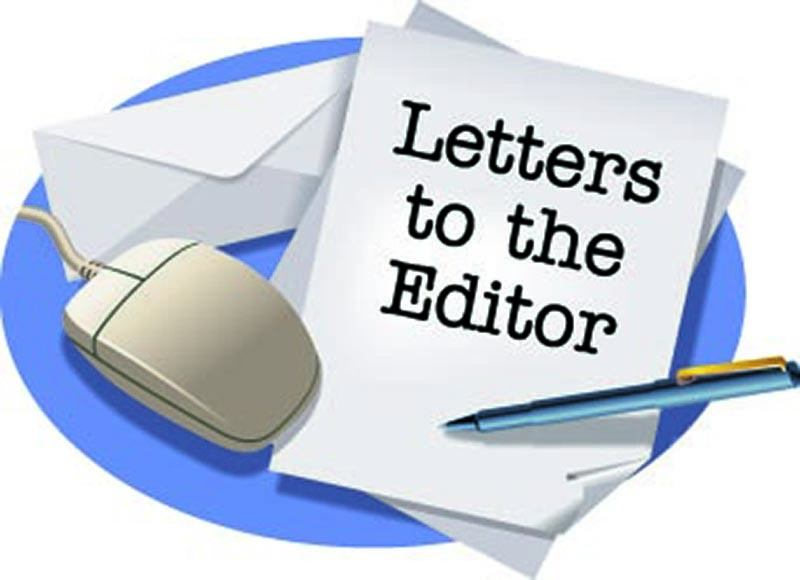 Their fear is regularly masked by arrogance, which Ms. Guichon continues in using the term “screed” to describe a previous letter and “marginal” in reference to the Fluoride Action Network. I find that suggestion, an opposition to freedom of the press, extremely offensive, especially from someone who teaches ethics to university students and even more so considering the legitimate evidence of harm that has come out in the past 15 months. Does Ms. Guichon consider the University of Toronto School of Public Health to be a marginal source? When future generations look back on fluoridation as a failed public health policy, one conclusion that is likely is that the practice continued much longer than it should have, because the promoters just couldn’t overcome their own bias and admit a mistake. Ms. Guichon is a fitting spokesperson for that group. A storm in March of 1973 washed out parts of Old Lakeshore Road, including this stretch east of Telfer Sideroad. 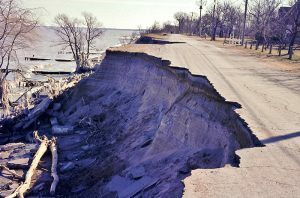 Sir: Regarding the Nov. 15 article, Erosion Spreads, about Sarnia’s failing infrastructure resulting from the high water levels and weather conditions. This is a story from the past, with history repeating itself. The stretch of Lakeshore Road between Rainbow Cove (Telfer Sideroad) and Bright’s Grove was reconstructed after the big storm of March, 1973, thereby creating “Old” Lakeshore Road and rerouting traffic to the “New” Lakeshore Road in that area. The picture attached, taken a few hundred metres east of the end of Telfer Sideroad, documents some of the damage done by that storm. Any structural reinforcing of the beach between Blackwell Sideroad and Bright’s Grove should reflect a strategic and long-term consideration, as stated by city construction manager Bob Williams. This photo reinforces what nature has in store. Sir: In his Nov 15th letter Paul Connett misstates a number of facts that I wish here to help clarify. As a public health researcher I’ve admired the way governments such as Australia  in 2017 (with its 700 page systematic review of all available evidence ), Alberta , and Canada  have committed to continually review  all available evidence to support their positions on the safety and efficacy of community water fluoridation. If anything arises, Ontario Health, Alberta Health and Health Canada would advise us to cease using community water fluoridation. Thus, simply trusting these scientists is not a bad call. They drink the same water as you and me! In contrast there is little reason to trust the writings of many of the ‘anti-fluoridation activists’ due to their tendency to distort or misrepresent information. More surprisingly, almost every single sentence Paul Connett wrote is either simply false or misleading. For example, Connett’s claim that ‘In fact, the claim that Calgarians’ cavities increased after fluoridation ceased was scientifically debunked. Tooth decay rates have declined significantly over the years equally in fluoridated and non-fluoridated countries.’ That is simply false , and members of the ‘Fluoride Action Network’ have repeatedly attacked the academics involved in publishing research  that contradicted their beliefs. Connett also claims there exists a ‘strong relationship between fluoride exposure to women during pregnancy and a sizeable reduction in their offspring’s IQ’ based off of the work of Bashash, 2017 ; yet Ontario Public Health  has already reviewed that study and concluded that ‘caution should be exercised in generalizing the results beyond cohort studied’ due to the many differences between Ontario and Mexico. And it contradicts research studying a similar topic in Calgary . I spent this past year studying at the University of Cambridge for my MPhil, and upon returning to Calgary, I’d have to say the one thing I miss most about Cambridge was drinking their fluoridated water .